Review In appearance, the new Intel Core i7 - based on the 'Nehalem' microarchitecture - looks like a bigger, chunkier version of the Core 2 Quad but under the heat spreader and casing it has a radical design that breaks new ground. New ground, that is, for Intel, but Core i7 seems to have rather a lot in common with AMD's Phenom microprocessor. 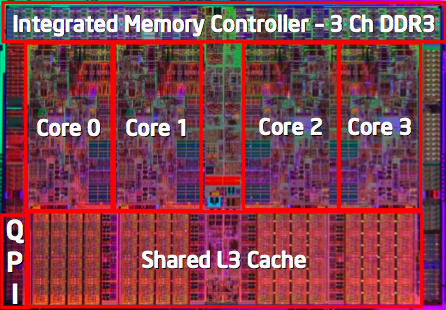 Both CPUs have four cores on a single die, unlike the pair of dual-core CPUs you’ll find inside a Core 2 Quad. Both have the memory controller integrated inside the processor. In addition, Core i7 has ditched the frontside bus and moved to the QuickPath Interface (QPI), which bears a strong resemblance to the HyperTransport bus AMD uses. QPI is the new name for Intel's erstwhile HyperTransport rival, Common System Interface (CSI). Intel has adopted a base clock speed of 133.33MHz that is used to drive the CPU speed, memory speed, QPI and the bizarrely named Uncore. Each part works in conjunction with a clock multiplier so, for instance, the 3.2GHz Core i7 965 Extreme runs at 24 x 133MHz, while its memory controller might run the 1066MHz DDR 3memory at 8 x 133MHz. Each processor core has its own multiplier, so the speed of the cores can be adjusted independently of each other, just like Phenom, which may sound intriguing to the overclockers among you but that’s only part of the story. Intel’s Turbo Mode technology adjusts the speed of the cores in the new processor dynamically and can raise the speed of a core by up to three multiples of the base clock, ie. 400MHz. Turbo Mode assists both performance and power saving as there are times when you're better off with two fast cores rather than four slower ones. The processor speed and power draw can adapt to the workload while monitoring the temperature of the cores to avoid overheating. Turbo Mode is assisted by the introduction of transistors that Intel calls power gates and which are transistors that don’t suffer from leakage when they're turned off so a core that is shut down doesn’t waste power. The Power Control Unit accounts for one million transistors and holds its operations in firmware loaded from the motherboard Bios, so the way the CPU operates can be updated with relative ease.